Calling all food concessionaires in the metro! 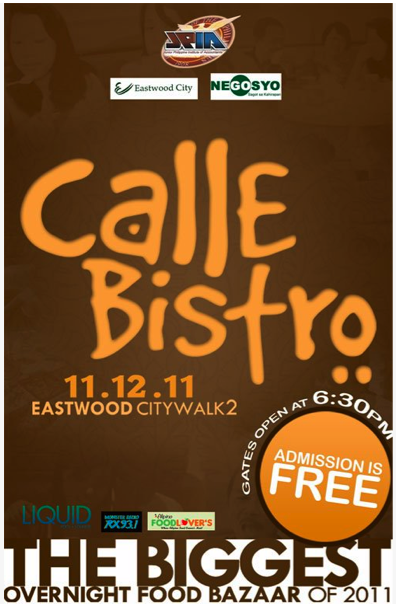 It’s time to flaunt out your menu and unique products this coming November 12 in Calle Bistro, 2011’s yummiest overnight food bazaar in Eastwood Citywalk 2. Organized by young business students, the UP Junior Philippine Institute of Accountants, Calle Bistro is a revolutionized food sale that will gather families, young professionals, students, and food enthusiasts all over the metro who are all eager satisfy their palettes with tasty and out of the ordinary dishes. Inspired by the goodness of just casually eating with good company, Calle Bistro will have a laid back ambiance enhanced by live bands playing good music and fun games to be organized by the event sponsors. This project aims to bring together budding food retail brands and enterprises and help them in promoting their products to provide a one of a kind food socialization experience where people from different walks of life can get a slice of the world right on their plates. Curious? Here’s a peek into what foods are already in store for the visitors—savory steak served with cheesy potatoes, beautifully crafted sushi and Japanese foods, our classic local Ilocos empanada, dumpling-wrapped tacos placed in funky egg cartons, and countless more in the list. These attractions make Calle Bistro an opportunity that should not be missed! Spice up our menu and be our next food concessionaire. m, or fill out the concessionaire application form in http://www.callebistro.tk/.